K is a tough one. I actually looked in the dictionary and saw the word knot, which reminded me of Shipping News, a book by Annie Proulx, the talented woman who wrote the original short story that was Brokeback Mountain. In this book, she introduced the chapters with a picture and description of different knots. Each specific knots has its own strength and way of connection - they are similar in a very simplistic way to relationships - and yet part of the beauty of knotting is that each knot can be tied and untied, made and remade, again and again. One of Proulx's themes was that some relationships must go through an examination of how they are bound to the past and how they can be loosened, remade or reformed into a totally different knot. 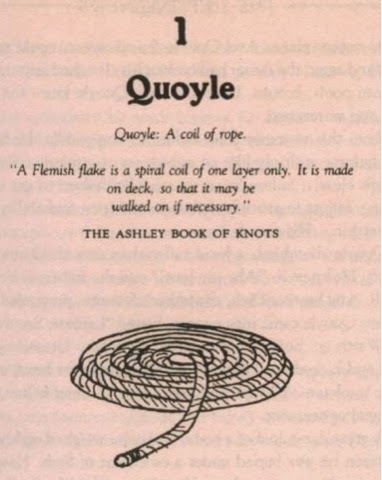 I love the idea that a simple rope can be twisted on itself in order to hold onto boats and docks and have a million other uses. Like our unimaginable strength when we are in the right frame of mind, the right knot. The reason I looked into Annie Proulx's writing is because Brokeback Mountain was a profound story. And in thinking of the knots and their symbolism in this movie, sometimes you get contorted into a knot that even if it is unwound, and forced open again, the kinks and turns from the last knot still remain, despite any new form it is put into. The muscle memory of the knot that held you best cannot really let you go. That is actually pretty cool. I have heard of "Shipping News" but only because of Brokeback Mountain.